Invisible. Insignificant. Deep down, have you always felt this way but never understood why? Generally, negative self-esteem develop as a result of being treated in ways that cause us to feel devalued by significant people in our lives. Therefore the true solution to low self-esteem is to apply the healing balm of truth to the wound in your soul in order that your mind will be transformed, causing you to build self confidence and gain self-esteem. If you look anywhere other than to God‚the God who created you with a purpose and a plan‚your view of your own value is in grave danger of being distorted. 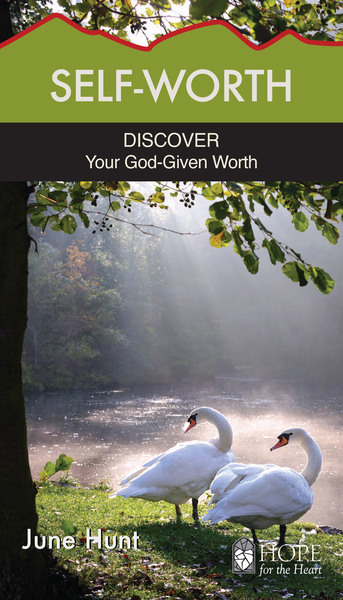 In this christian book by June Hunt, learn how to gain self-confidence--confidence based on God and a healthy perspective of your identity in Christ. Before you were ever born, God established your real worth by knowing you, by choosing you, and ultimately by dying for you! Learn to leave behind feelings of worthlessness, and experience your true worth‚the worth you have in the eyes of your heavenly Father.